In 2013, India’s government planned to construct a large number of solar ultra-mega power plants (UMPPs) in 4 different places in the country. Two of these giant 4,000-5,000 MW solar plants were supposed to come up in the northern part of the country in Ladakh and Kargil. There is a large area of barren land in these regions and the solar insolation is also extremely high, making them ideal for solar generation. 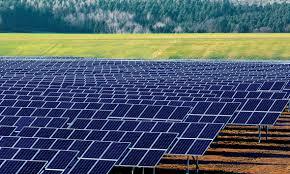 Read more about Solar parks in India. But since 2013, none of these solar UMPPs have made any progress till date. The main reason being the lack of coordination between the various different government entities, who would have to come together to get these mega project going. With a cost of around INR 30,000-50,000 crore, these projects would require extremely good project management skills and coordination amongst various entities. PowerGrid would be required to construct a high capacity transmission line from the Ladakh region to the northern grid of the country. This would entail high expenditure, given the long line that would need to be developed. Also since transmission charges are not there for solar power, this line would have to be financed by other power users or the government. The second big problem is that no state government has come forward to buy this large amounts of power that will be generated. Jammu and Kashmir is a small state and does not have a large power requirement. This would mean that most of the power would have to be sold to other states. With most of the country turning power surplus in the recent past, interest has waned amongst states to buy power from other states. Also power in the Indian Energy Exchange is trading at a very low level of INR 2.5/kWh. Also read List of 8 Largest Solar Farms Around the World. The third problem is that there has been no agreement on how the money from the solar power plant will be shared with the local area development councils. Unlike hydro power, solar power still has to be subsidized by the government. Therefore there is no surplus that can be shared with the local area councils. So the combined lack of interest amongst all users is a major concern for all. Also the governments’ other solar parks and state solar tenders are all running quite well, negating the need for these massive solar plants which come up with their own unique financing and project management issues. Solar cost which was supposed to touch new lows through these giant solar plants are also already low now. Rajasthan state tenders are seeing prices of INR 4.3/ kWh and it seems unlikely that these UMPPS along with their transmission costs will be able to match these prices. Senior officials in the ministry of new and renewable energy (MNRE) confirmed the reluctance of central departments and said evacuation (of what was generated) was a major impediment, along with lack of coordination with state agencies. “PGCIL is just building a 220 Kv line in that area and there is no plan to expand capacity. The idea to award the corridor to private companies through the bidding route has also been shelved, as it is in a strategically important location,” said an MNRE official, requesting anonymity.